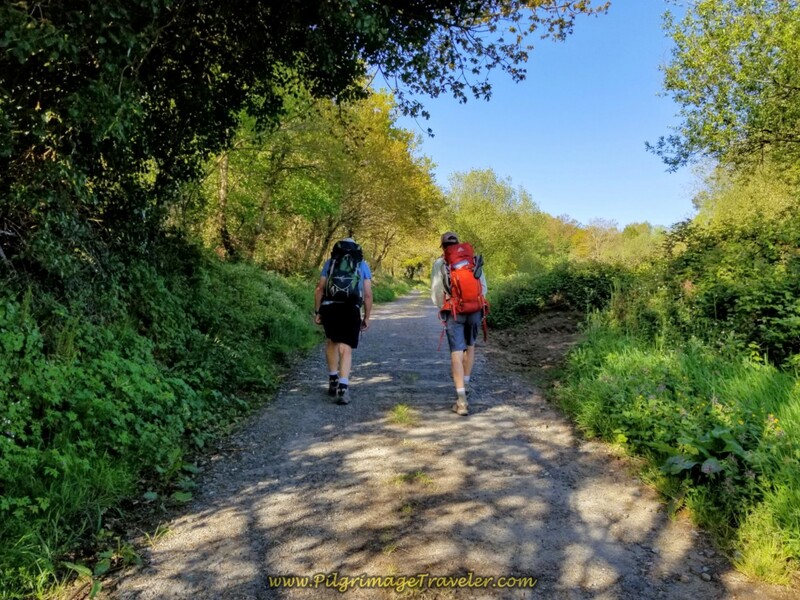 Our day six on the Camino Inglés was short, yet difficult, as the relentless hill-climbing continued. At least the Way here was rural, mostly shaded, and on quiet forest lanes for most of the day. This day was a challenge, in more ways than one as we sought to fit into cultural norms that were different than ours. 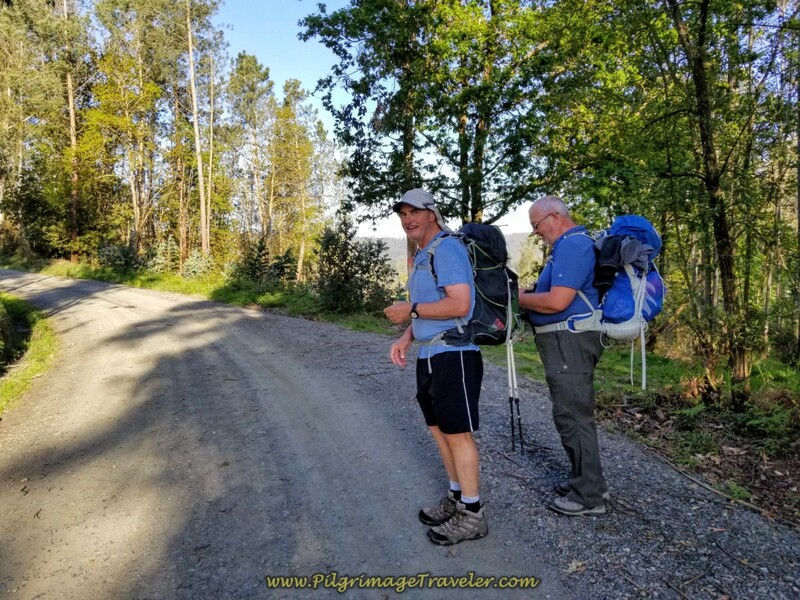 Tired and hungry pilgrims are discouraged pilgrims! Day six is quite rural, offering few services for the pilgrimage traveler. 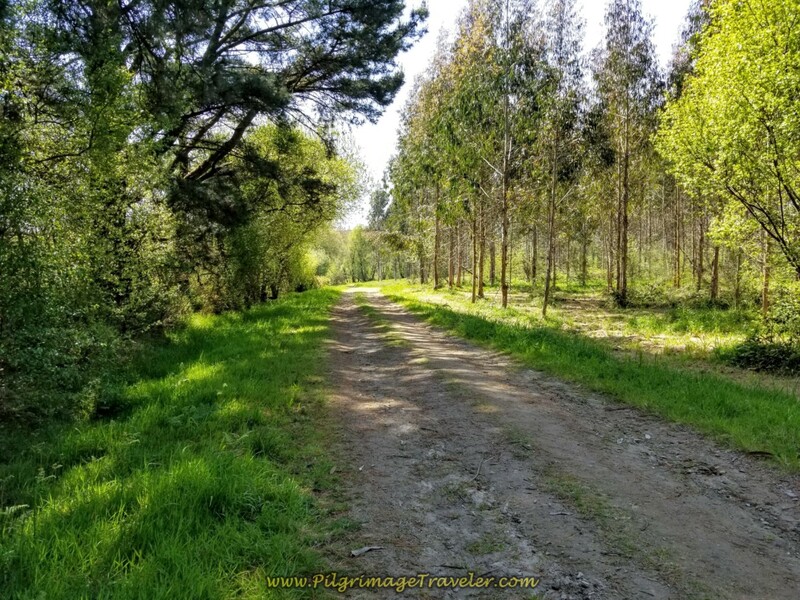 The Camino here walks through forest after forest on dirt roads, that intersect only a few small towns. 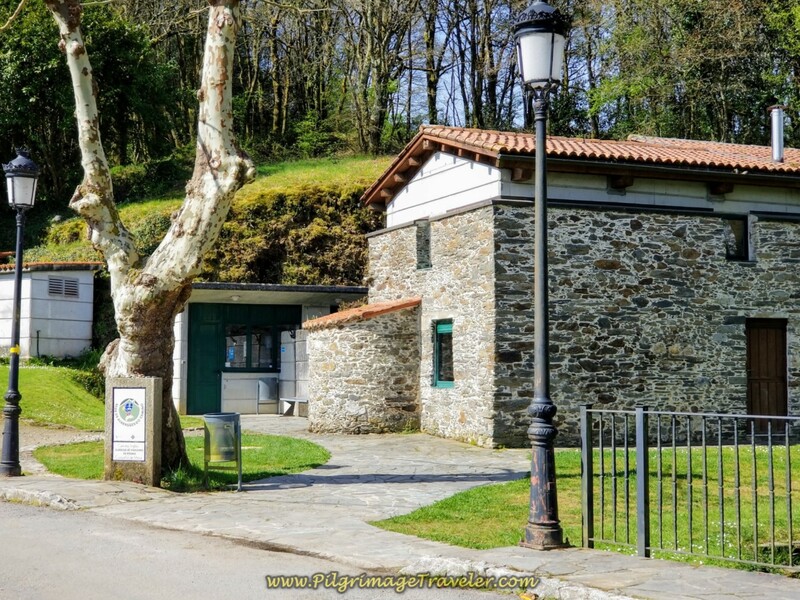 Be sure your pack is full of plenty of food and water for your day, especially if you are starting from Betanzos. Stock up at a city before Presedo as there is nothing there! Here is our Google map, uploaded from our GPS tracks, with available services placed on it to assist your planning for the day. It is a steady climb starting 2.5 kilometers after Presedo for over 5.0 kilometers. 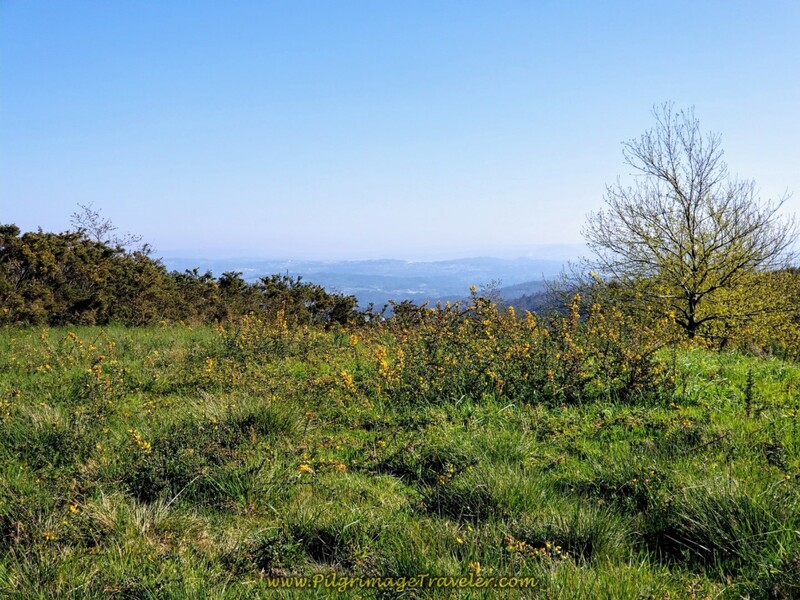 The elevation gain is over 400 meters (1400 feet). You will feel this climb! 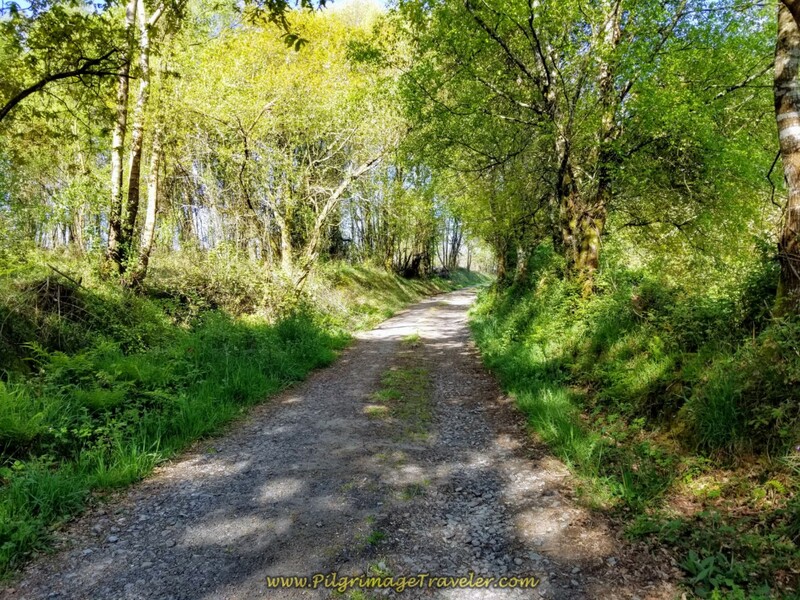 Settle into the day, breathe and reflect on why you are doing this Camino! Is it such a mystery? 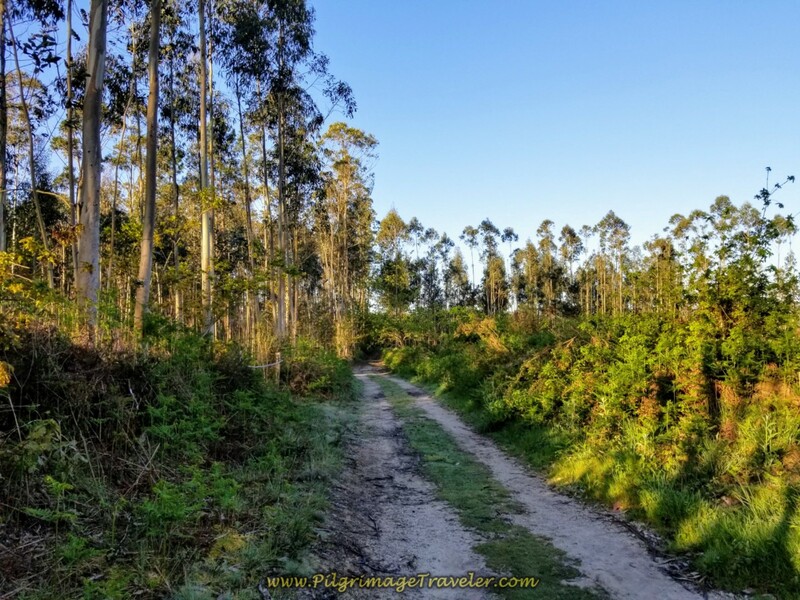 I did include the 1.8 kilometer walk to the town of Ó Mesón do Vento in the day's distance total, so if you are stopping at the albergue in Bruma, the total distance for day six is only 11.17 kilometers. We all arose in good spirits and ready for the day. We had come to Presedo prepared for the day, having carried sufficient food and instant coffee in our packs for breakfast. It was to be enough to get us the 9.5 kilometers to the Bar Avelina in As Travesas. Rich and I knew the bar, as it is where the Coruña Arm of the English Way, on day two joins the Ferrol Arm. It was worth going the distance to relax and eat there. 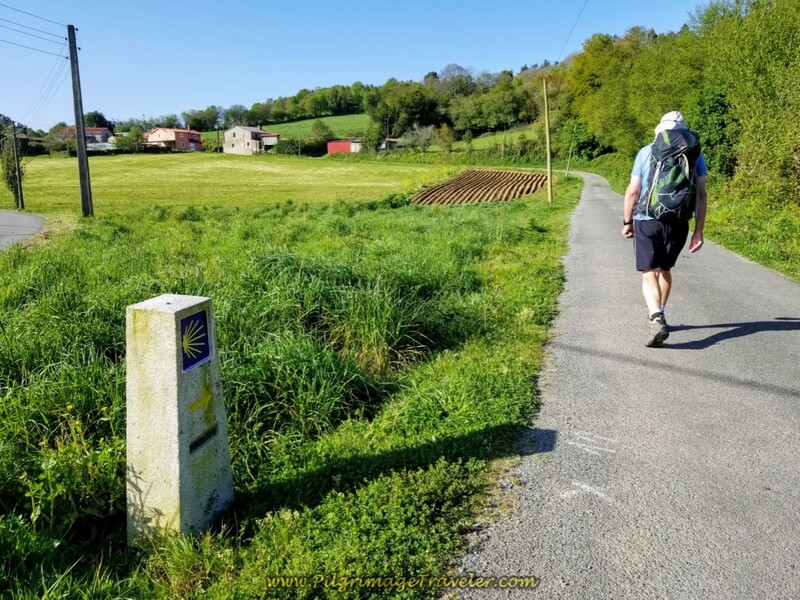 After leaving the albergue we walked back up the hill, across the DP-0105 to rejoin the Camino Inglés where we left it the day before. Presedo is not much of a town, and the back lane behind it looks like there is not even a town! Indeed, the way becomes a dirt lane within a few meters. In about only 600 meters on day six, the Camino Inglés walks by the Mesón Museo, the incredible place where we ate dinner on day five. They were closed as we walked by. I doubt it opens much before 9:00 in the morning. In another 600 meters, we turned right by the 52 kilometer marker, shown below. 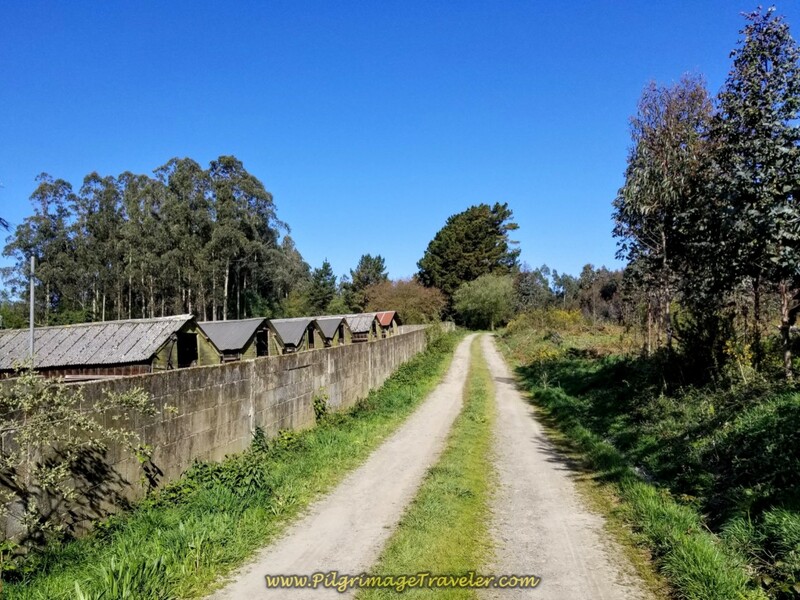 We were more than halfway to Santiago and our final two days were to be long ones. The English Way turns to a sort of semi-pavement here, half dirt, half pavement. It essentially parallels the main road, the DP-0105 but takes the extreme rural route to the east. 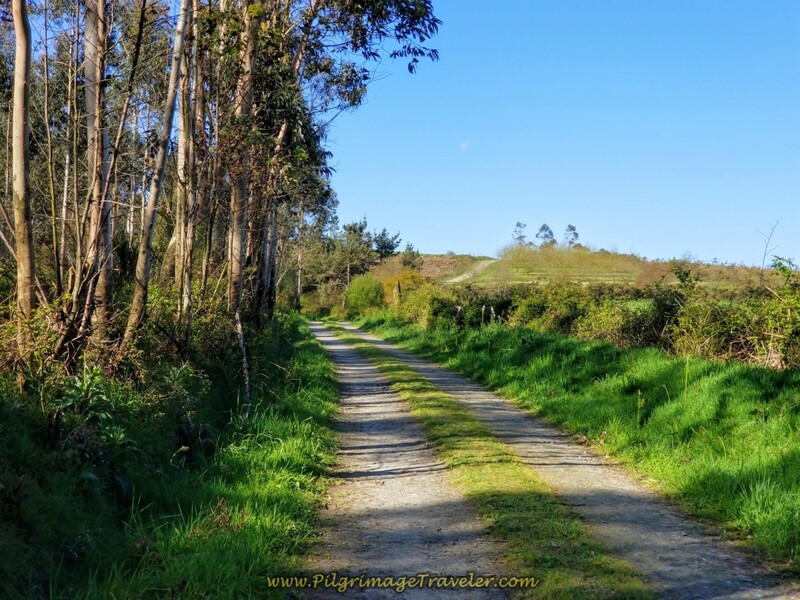 If you are seeking a quiet Camino, albeit mostly paved, this is your Camino! In 1/4 kilometer from the 52k marker, turn left, then an almost immediate right turn at the red brick building shown below. 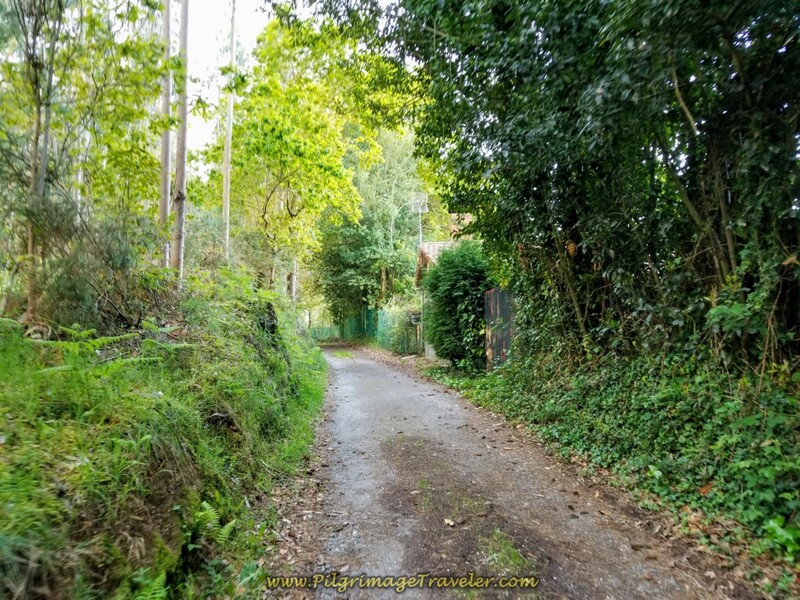 The lane ahead is a casual two-track forest lane, both quaint and quiet for a brief 200 meters. 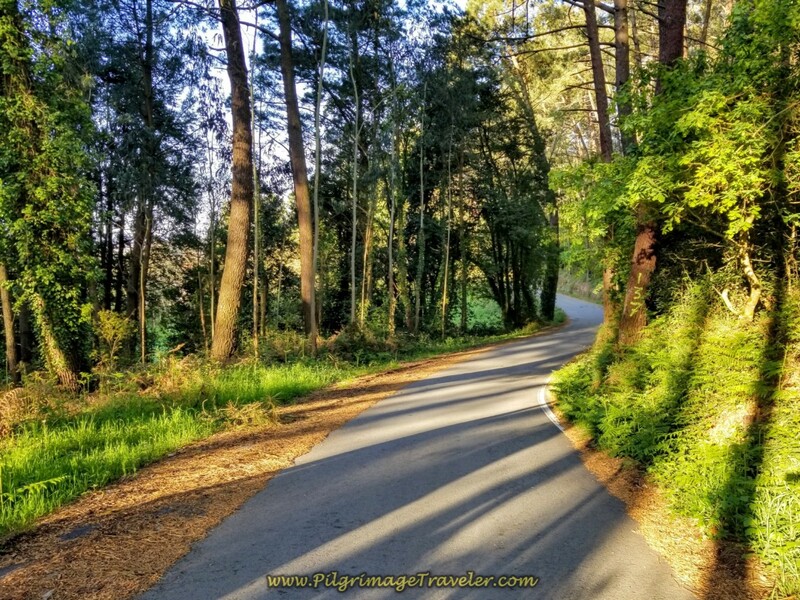 We came to a T-intersection and turned left onto this windy paved road through more forest. The deep shadows of the early morning light lifted my spirits, as the freshness of a new day always does. 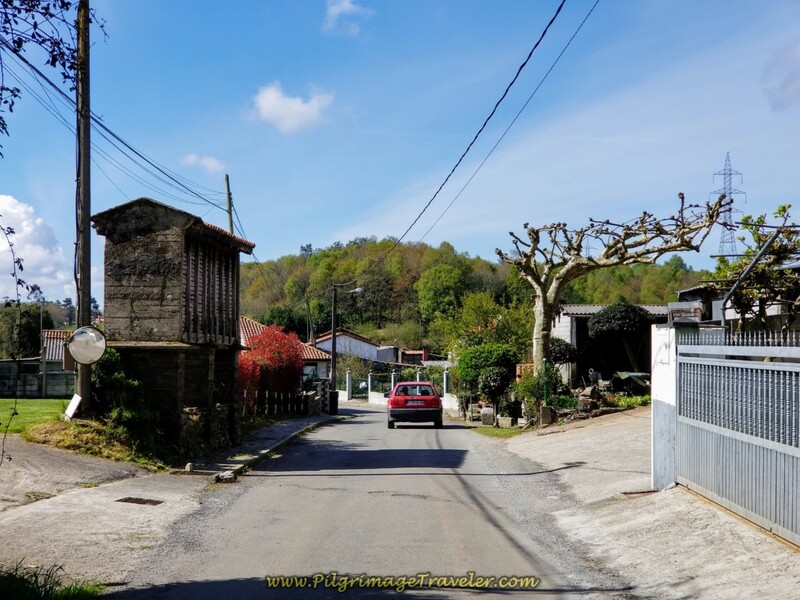 After 400 meters of walking, you arrive at the hamlet of Leiro, in the parish of Abegondo. You will first come to a picnic area where you will see another old information board, shown below. This is a lovely, shady place to stop for a picnic lunch, with a potable water fountain to fill your reserves if needed. Beware the information on these old boards! 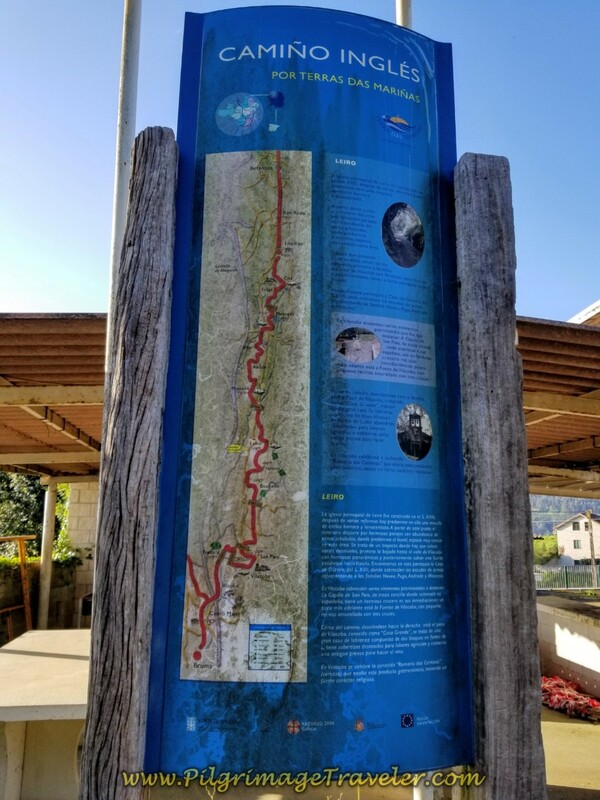 They are no longer current, so unless you are intending to walk the old route, read the historical information and know that the maps no longer depict the current route. The Old English Way Information Board in Leiro ~ Maps No Longer Current! 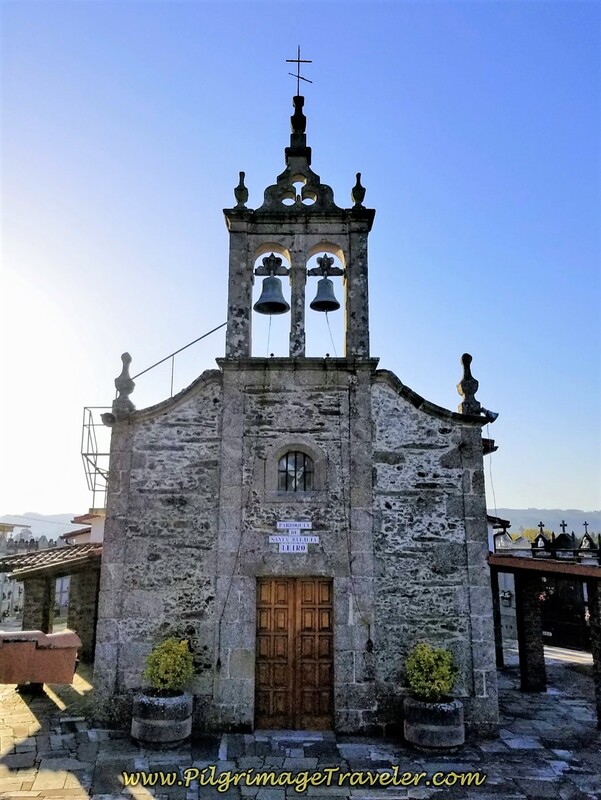 A few meters onward from the picnic area is the lovely church, the 18th century Iglesia de Santa Eulalia de Leiro. It is after the church in Leiro that the route changes are the most dramatic. While the old route walks straight on after the church, the current route takes an immediate right for 200 meters to join the DP-0105. It is at this intersection, shown below that the new route turns to the left to join the DP-0105. 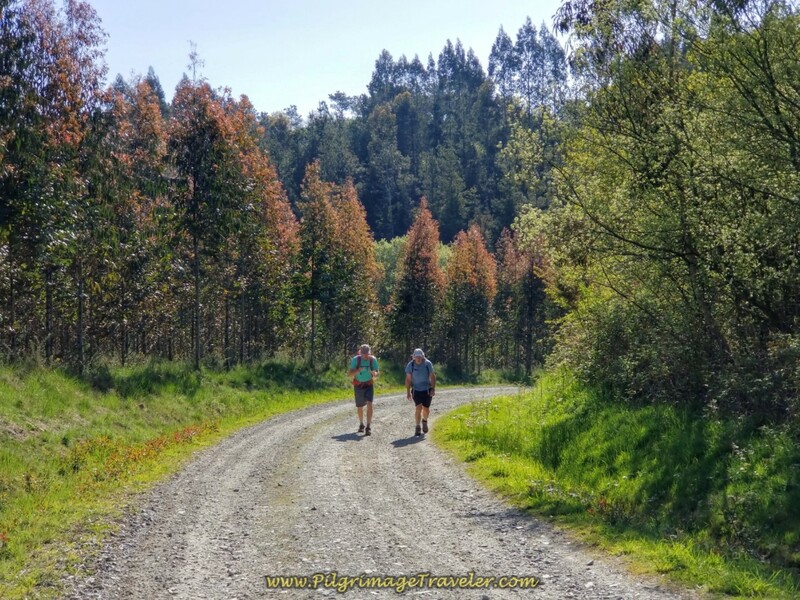 Walk on the DP-0105 for 300 meters, turning right onto a long, gravel forest road. 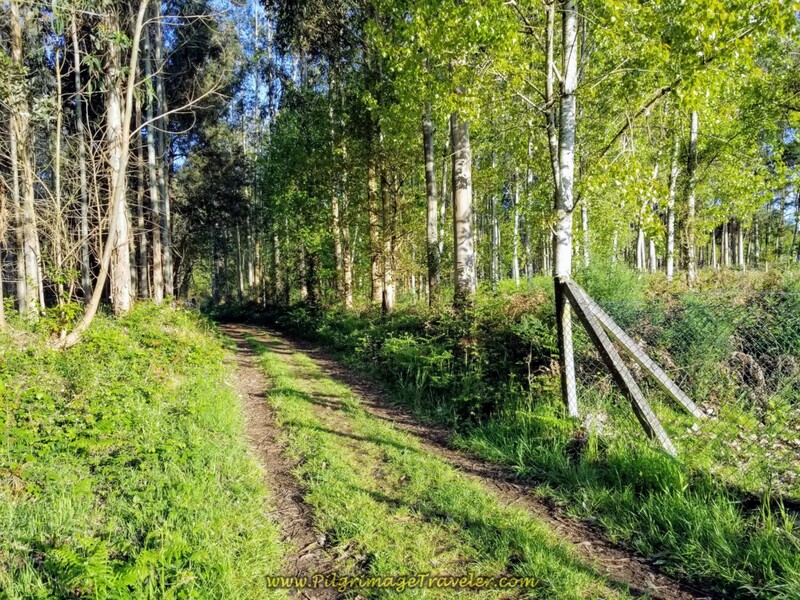 This forest road lasts for over 2.5 kilometers. 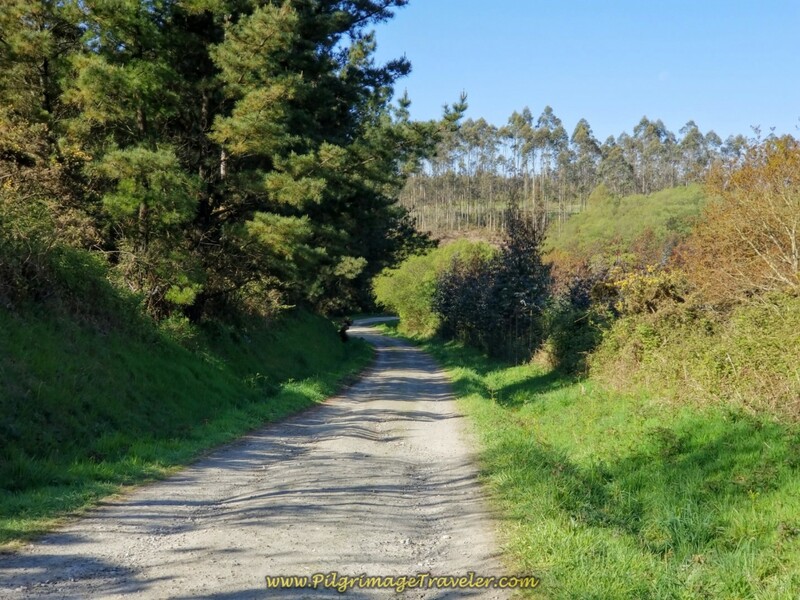 It is when you reach this gravel road just after Leiro that the long, over five kilometer climb begins! Breathe and settle in because this is stretch will require a sustained effort. Don't push it or force yourself to walk harder, because you will only get worn out sooner! Thus far, our group was going well, walking steadily onward and upward. 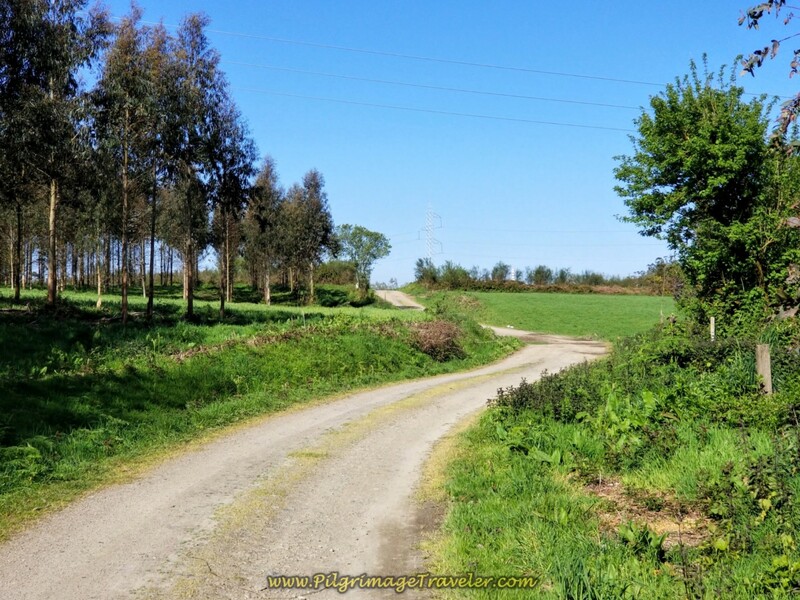 The new route takes a direct approach on this long, wide gravel road, completely without traffic. 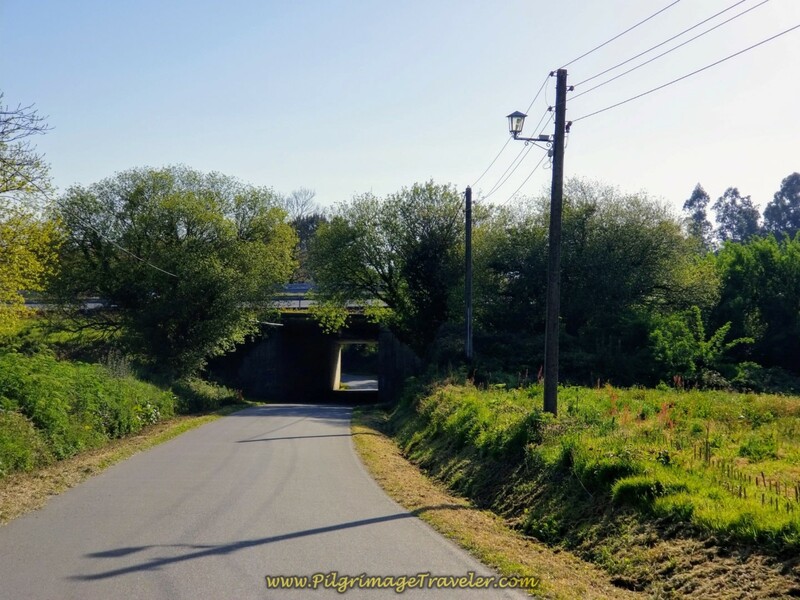 In my opinion, this route is not as beautiful nor as quaint as the old route's meanderings through the villages and farms. However, it is most certainly a safer one! 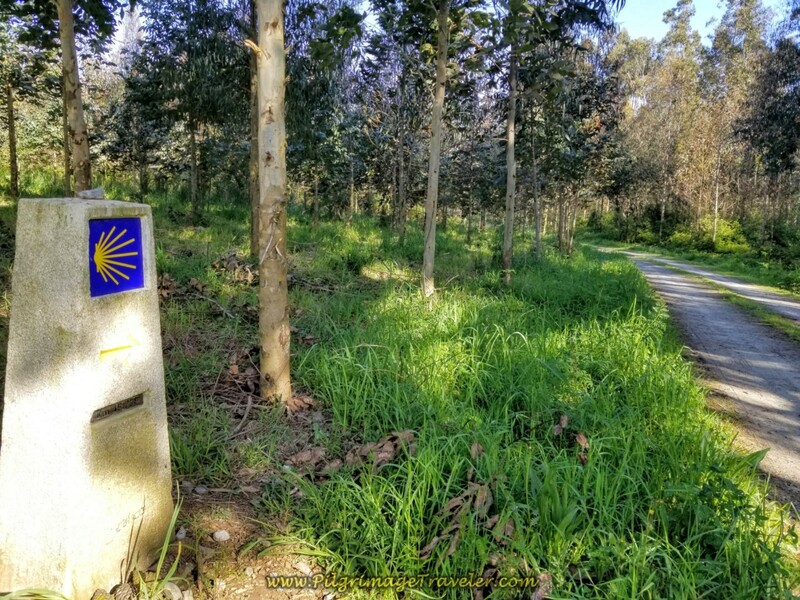 If you are interested in walking the old route by the Casa Julia, and through the farms and are a strong walker, contact me and I will send you the GPS tracks of the old route. The new route, being more direct is a full 2.0 kilometers shorter than the old. 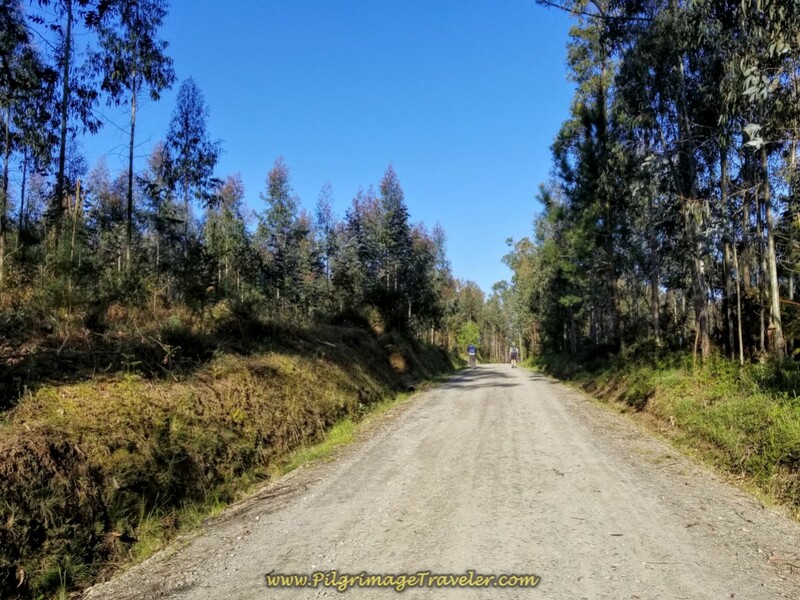 After walking the full 2.5 kilometers on the gravel forest road, the road becomes paved just before the newly-built park and reservoir called the Encoro de Beche. You can see the small damned reservoir on your left as you walk by. There are nice picnic tables to rest and have a picnic if you desire. After walking by the park, you come to a T-intersection and take a left onto another quiet paved road, shown below. 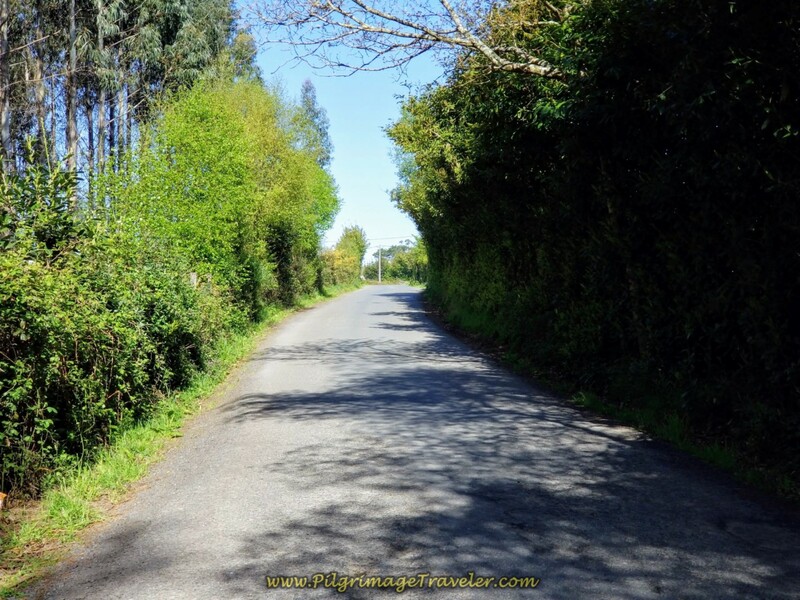 We were lucky to see a deer standing in the road as we approached! The English Way on day six also flattens out through this stretch, so you will have a nice reprieve for your lungs. This now paved road takes you to and walks you under the E-1. 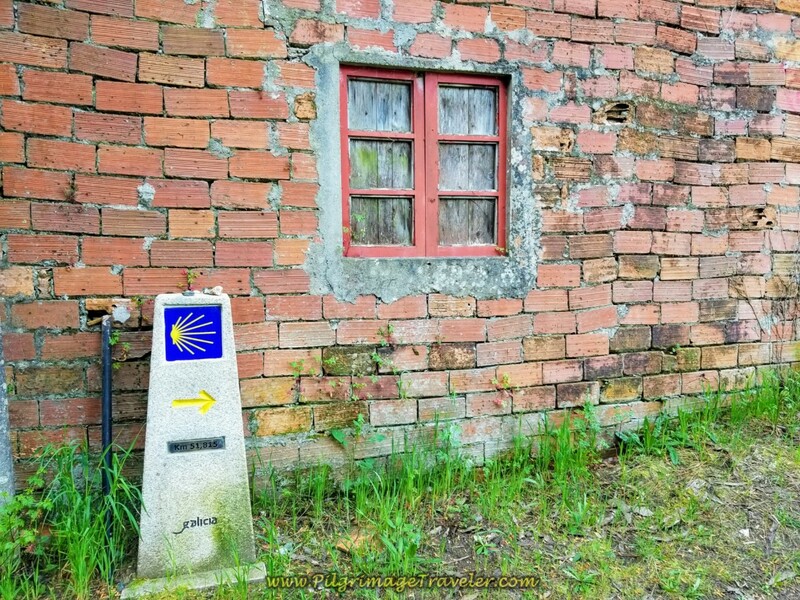 We passed by the concrete marker here, staying right, just before the next village of Vao, ahead. 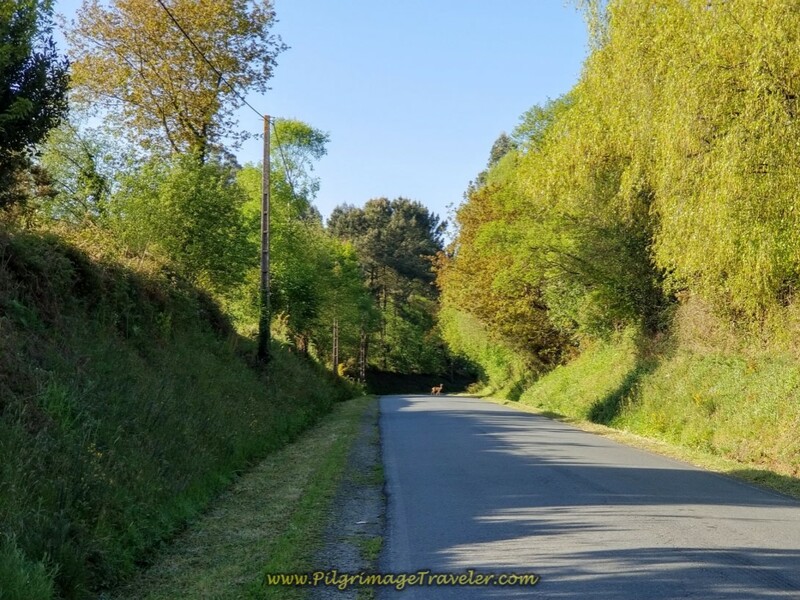 After 3/4 kilometer of pavement walking and after coming into the hamlet of Vao, the Camino once again takes a turn uphill for the next steep part of the climb for the day. When you reach Vao, you are essentially halfway through day six of the English Way. 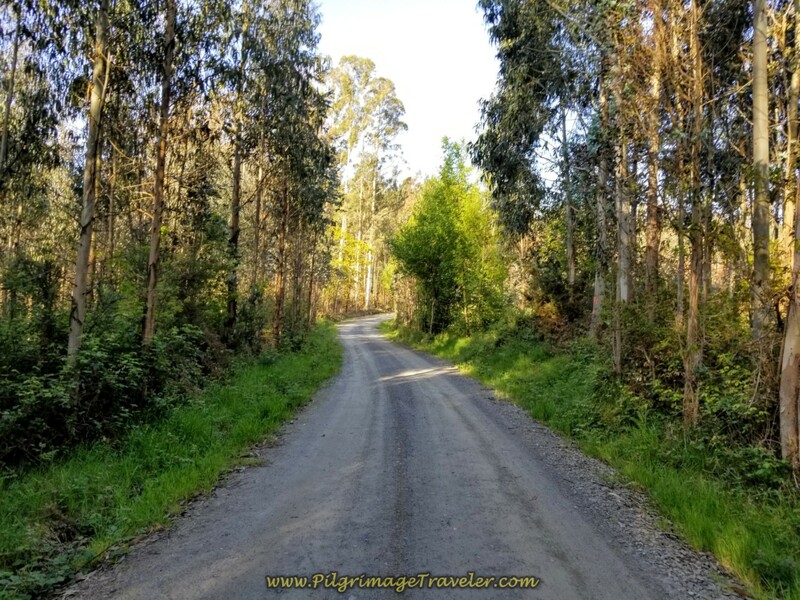 Within the town of Vao, we were directed to turn right onto yet another gravel road, to continue the climb up and back into the forest. 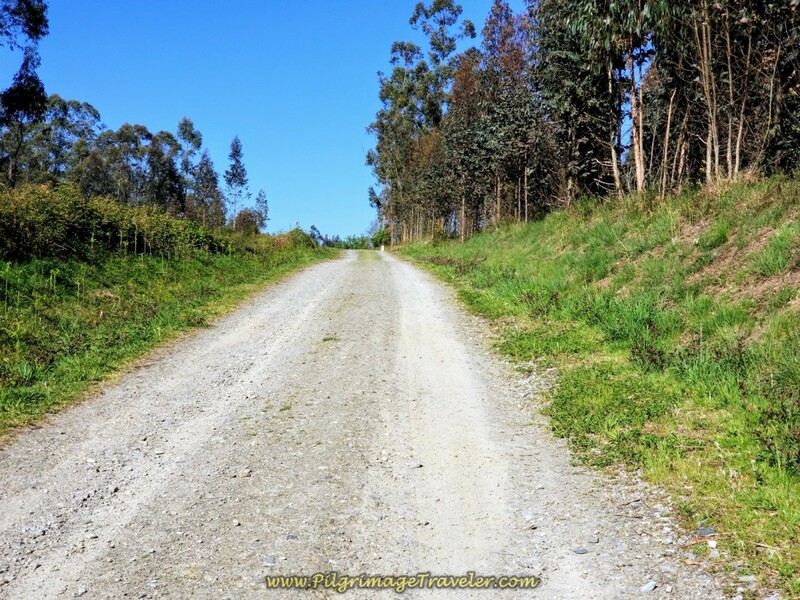 After turning up the hill in Vao, walk on for 1.25 kilometers of steep climbing on this gravel road. The English Way is at least shaded through this narrow lane. This was a good thing since day six was becoming quite hot, despite it being early May! We came to a T-intersection and took a right here at the 45.8 kilometer marker. 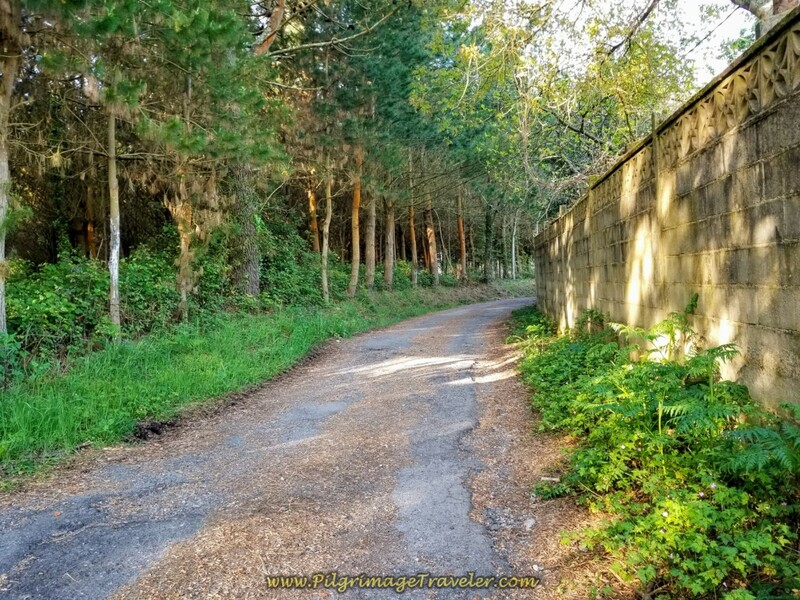 We walked less than 100 meters, and turned left onto another rural lane, which opens up from the forest. It is about 1/2 kilometer of steep climbing, after the prior turn, to a top-off area, seen ahead on the photo below. Almost there! After reaching the summit, there is a brief downhill, shown below. After the nice and brief downhill portion, there is another, final climb for the day that presents itself ahead. 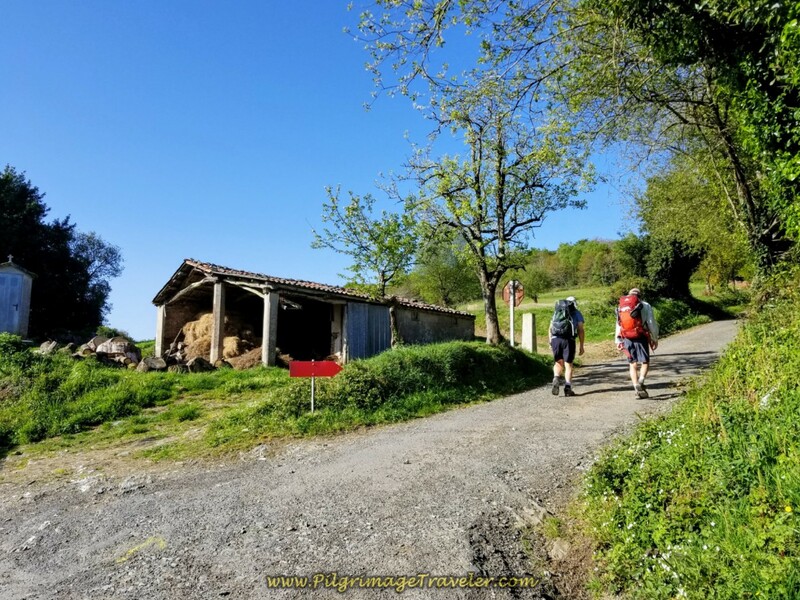 We were all moving well, even though it was a tiring climb, on day six of our Camino Inglés. 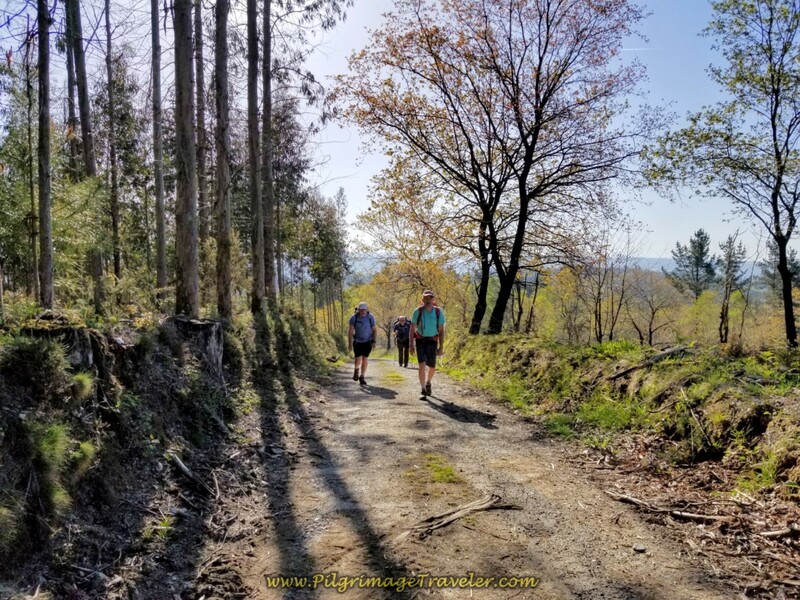 We had plenty of time and a reservation in Ó Mesón do Vento, so aside from being eager to get to a café as noon approached, we had no worries. It is about 1.4 kilometers onward from the previous top until coming to a T-intersection. It is here that you turn right onto pavement, show below, towards the town of As Travesas. 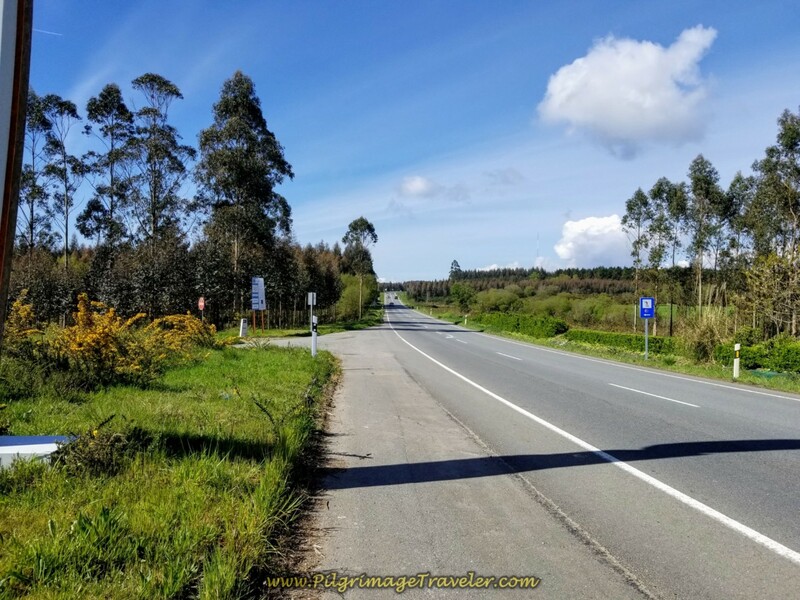 It is 200 meters on the paved road, when you come to the AC-542 in As Travesas, shown below. Turn left at this intersection. 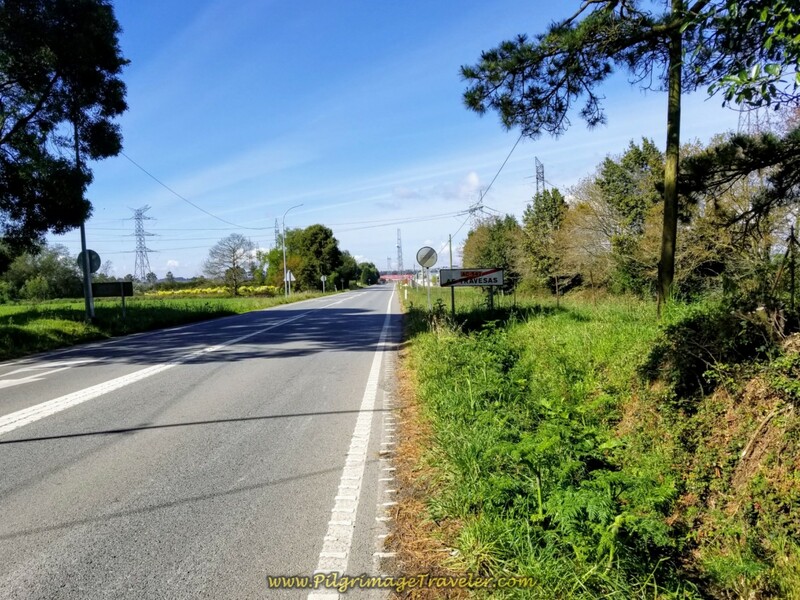 It is at this intersection, where the La Coruña Arm of the English Way joins the Ferrol Arm. In just over 300 meters along the AC-542, we walked by the super friendly Bar Avelina, shown below. I highly recommend that you stop here and see the pilgrim's church, just across the street from the bar. This café and bar is the town hub and it is always hopping in the middle of the day. 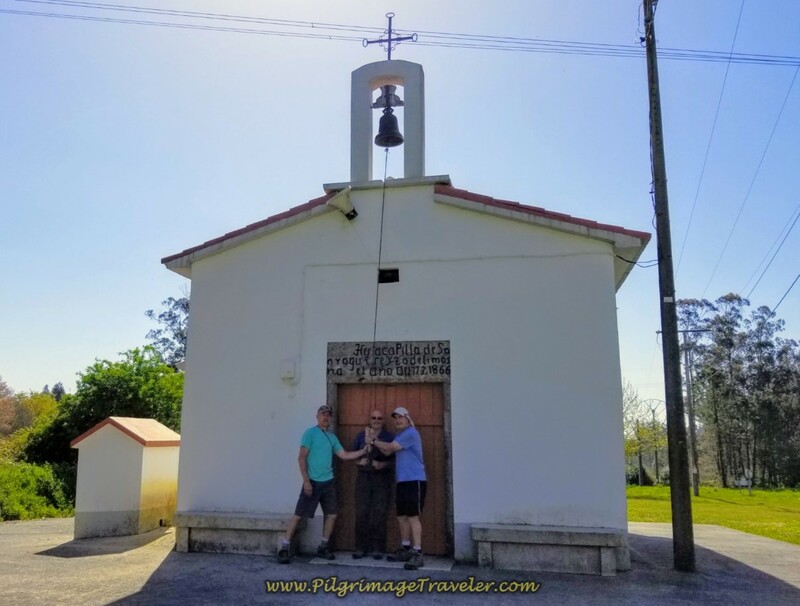 The food is great, the proprietress is very friendly and the chapel, the Capela de San Roque is supported entirely by pilgrims. The proprietress and/or her daughter may ask you for a donation for the chapel. She will show you a basket full of envelopes, on which prior pilgrims have written their name and country of origin and where they have placed their individual donations. She will ask you also for your spare change. It is fun to donate, and the proprietress will most likely want to show you the names of all the other pilgrims that have passed through in recent days. Even if you don't know Spanish, after reading this, you will understand! The proprietress speaks no English! 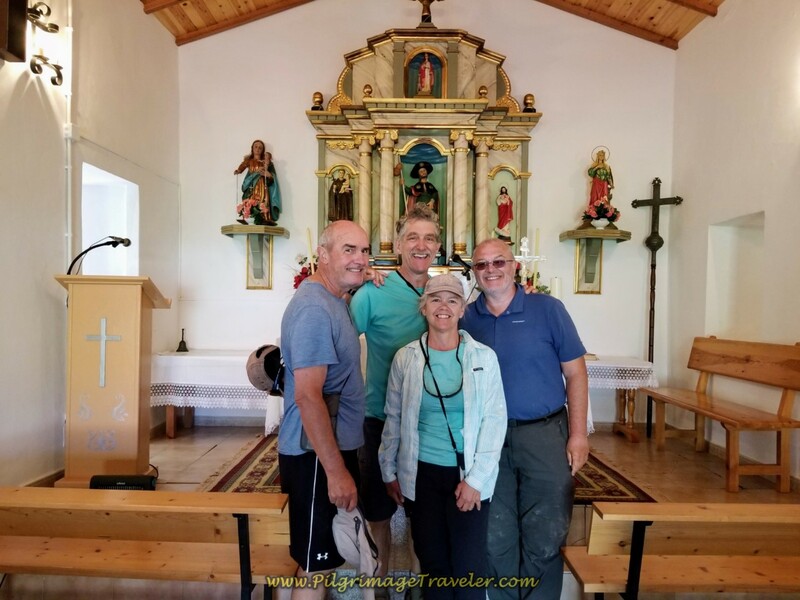 Take the time to tour this quaint chapel, if you can. It is worth your spare change! This was our second stop here, as both arms of the English Way now come through As Travesas. The proprietress even recognized us! She furiously sorted through the envelopes in the basket to find our envelope from only a few days prior when we completed the La Coruña arm. If you want to see the church, ask for the key at the bar, from the proprietress. Rich even asked her if we could ring the church bell, which she allowed! Here are the three gents testing out the bell, in the next photo. It worked! 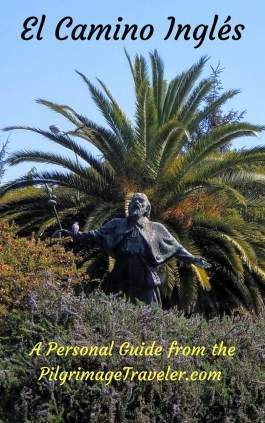 If you are unfamiliar with San Roque, the patron saint of dogs, and his legend, click here. The proprietress of the Bar Avelina came along with us to the chapel, to take our photo. If she is busy when you arrive, she may just give you the key for you to use yourself. The proprietress of the bar gave us a huge motherly hug as we went to leave. She is the matron of the church, and perhaps the town as she cares for their needs at the counter of her establishment! We felt very loved and nurtured by her and were reluctant to continue on. It is a total of about 1.6 kilometers on the AC-542 through As Travesas. 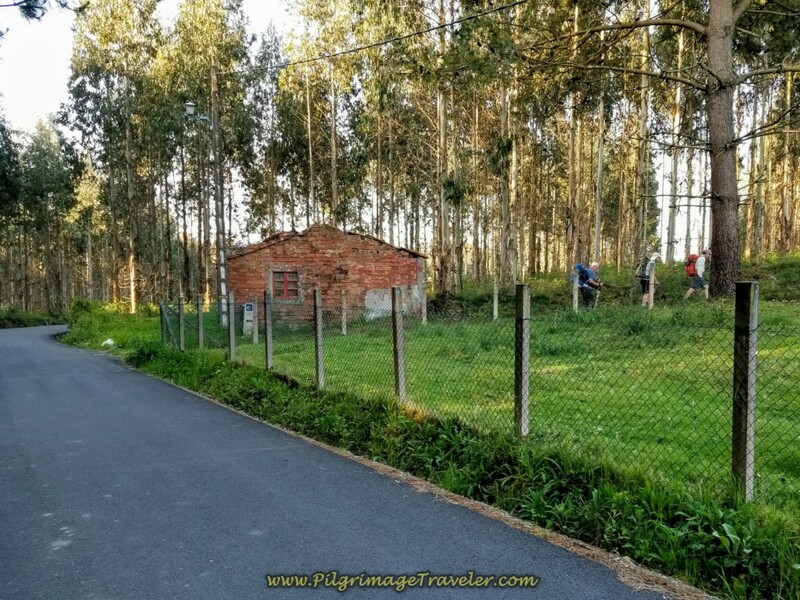 After our bellies were full of bocadillos (sandwiches) and café con leche (coffee with milk), we continued on down the AC-542 toward Hospital de Bruma. Just after the Bar Avelina, there is another blue information board. Just beyond the board is the sign, below, announcing that we were leaving As Travesas. 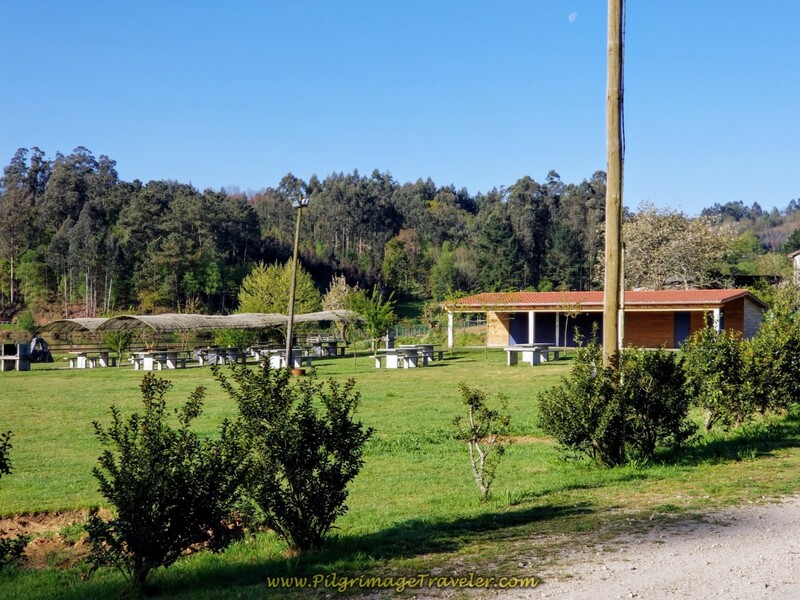 In another kilometer from the Bar Avelina, pass the electric substation of Mesón do Vento. Then pass the 42.2 kilometer marker. Next pass the Repsol gas station. It is not very nice walking along this busy road. 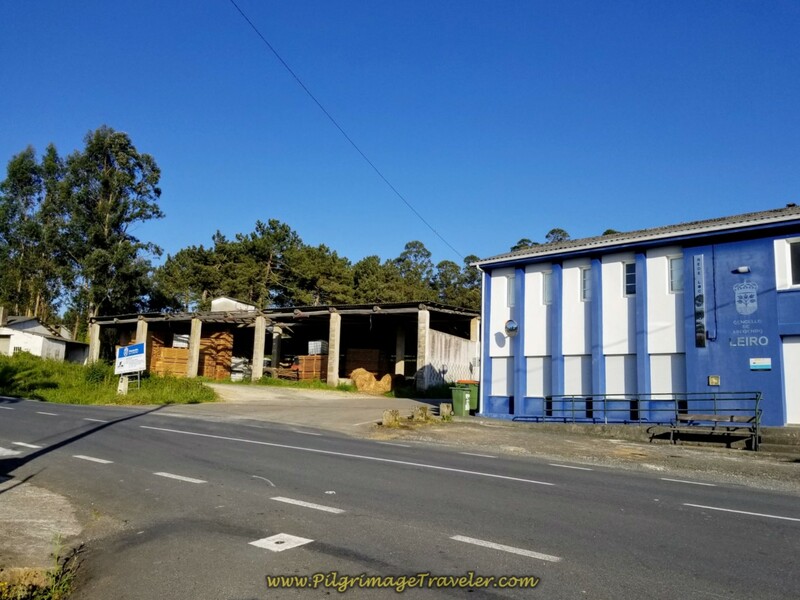 In the past the Ferrol arm of the English Way did not come through this highway. I felt it was unfortunate that it now does, but I couldn't complain about visiting the Bar Avelina and the pilgrim's church. After the gas station, turn left from the AC-542, shown below. 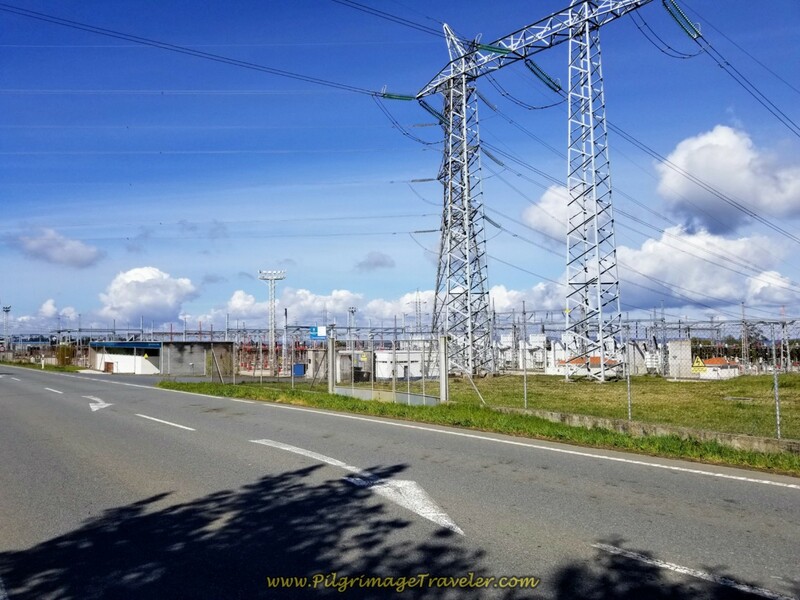 Just beyond the electrical substation is a bronze age site, called the Castro das Travesas or the Castro Hill Fort. We did not see this, but it may be worth a side trip if you are a history buff. Not much is left of the castro but the dirt mounds. Turn right immediately after the electric switching area to see the historical marker and mounds. 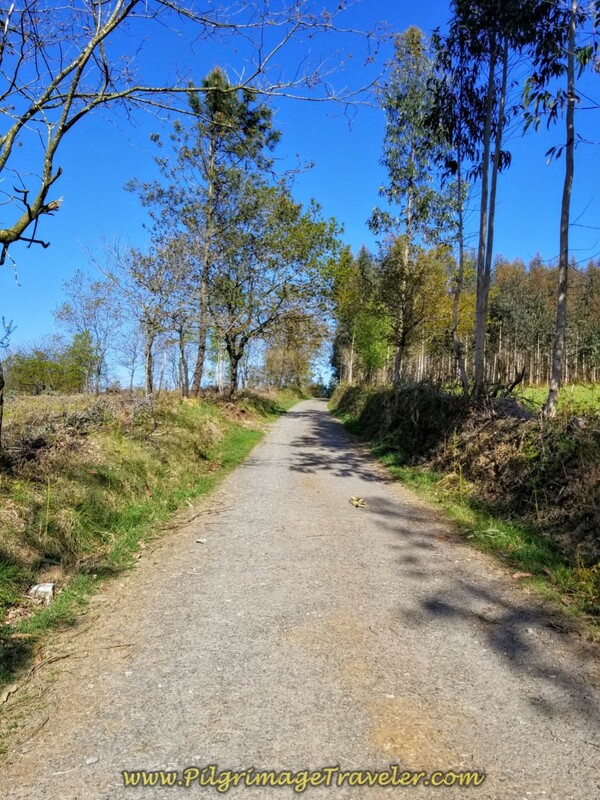 After leaving the AC-542, you walk on this quiet country lane, shown below, and back into a forested area towards Bruma. 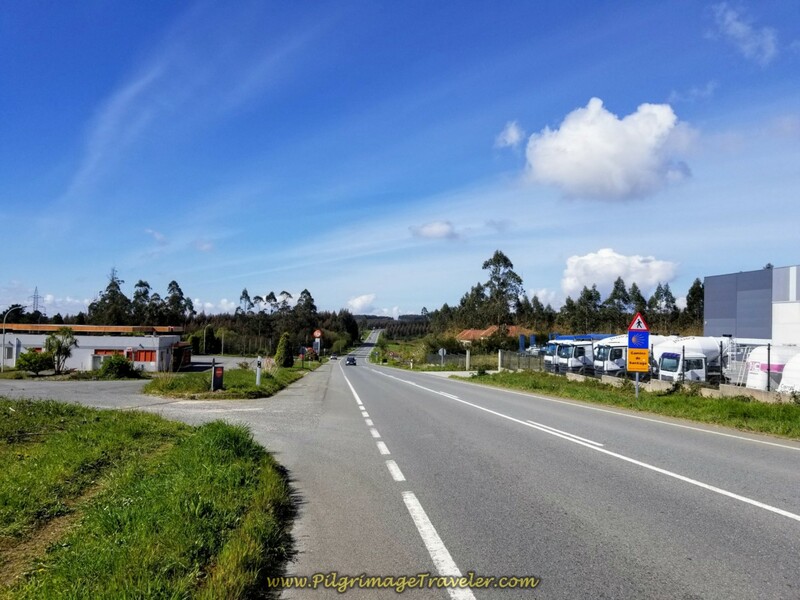 If your destination is not the albergue, but one of the hotels in Mesón do Vento, you could continue straight on the AC-542 to reach the town. 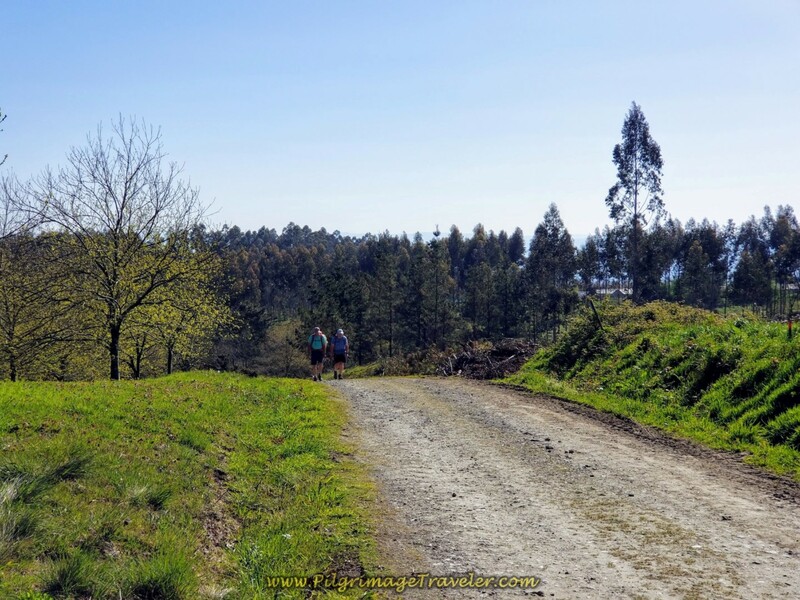 This will be a shortcut, rather than following the Camino to Hospital de Bruma. 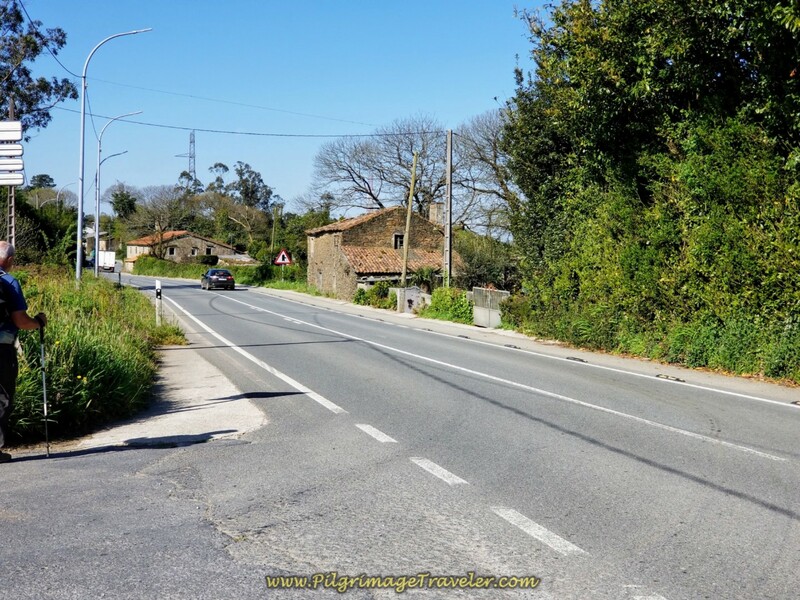 You will walk about one kilometer on the county lane until it ends at this T-intersection shown below, where you join the pavement by turning right, entering the town of Hospital de Bruma. We were close to completing our day six on the English Way! After you walk only a few meters, turn to the left, to walk through the town and towards the albergue. Walk by this lovely horreo. 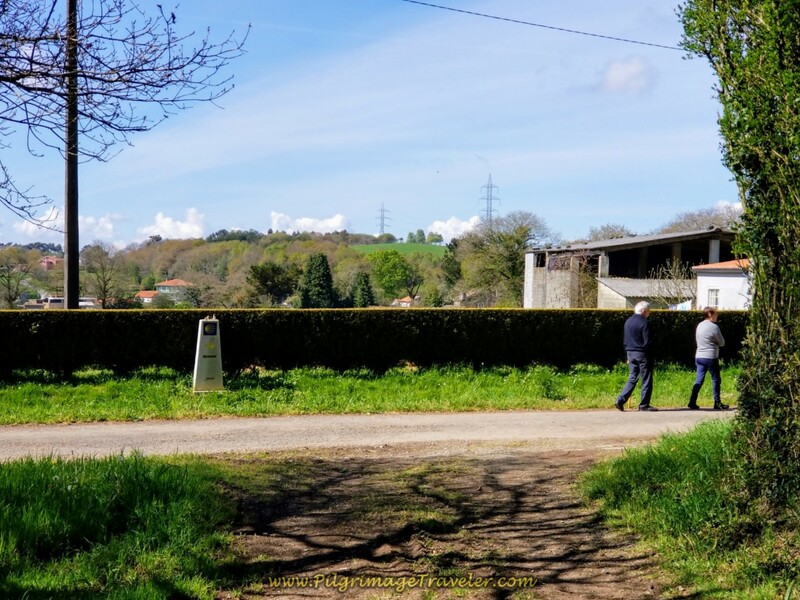 After a short 1/2 kilometer, you will arrive at the Albergue de Hospital de Bruma. This beautiful old stone building can be quite cold in the cusp seasons, as I came to find out when I stayed here in September, four years prior. 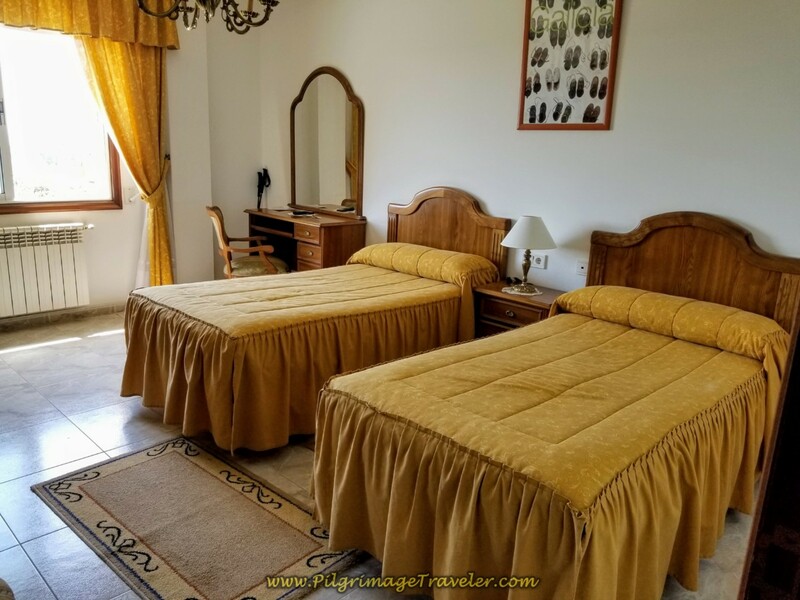 It has 26 beds, and fills up quickly in the high season. It also has a kitchen, but I never used it. 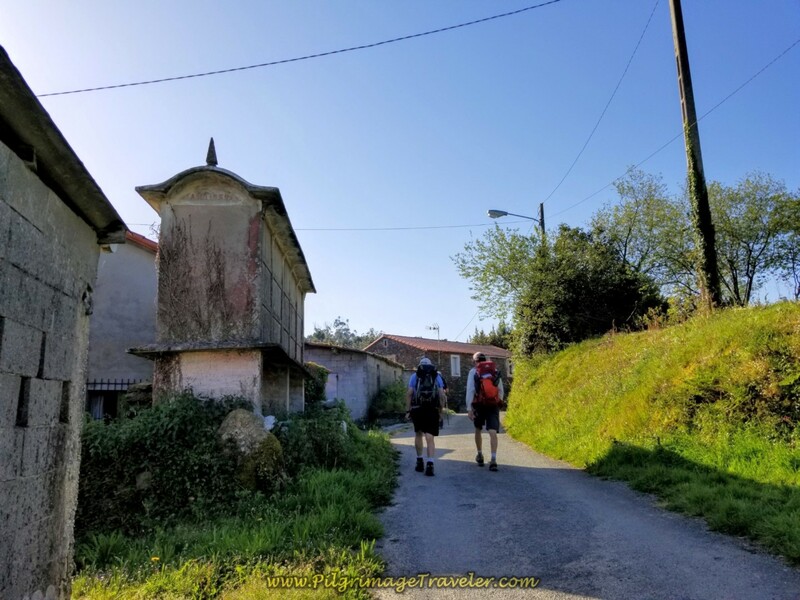 After our prior three nights stay in an albergue, and since I didn't want to be cold that night in early May, we all decided it was time for a nice hotel and walked onward to the town of Ó Mesón do Vento, back on the AC-542. It is a 1.8 kilometer walk. We chose to stay in the family-run PR Ó Mesón Novo, show below. This was Rich and my room. We usually choose two single beds, because the doubles are quite small for his height, and he is more comfortable with the twins. 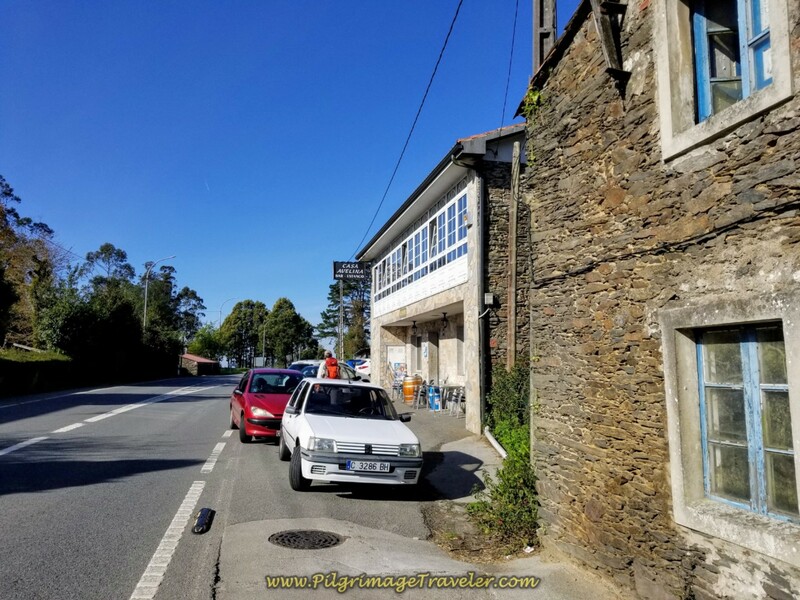 If your day was very long, coming from Betanzos and if you can't walk another 1.8 kilometers to Ó Mesón do Vento, you can call the hotels here and they will most certainly pick you up at the albergue! Click on the link to reserve and get their contact information. Bruma may be a pinch point, so if you know your dates, you may want to reserve here now. The family at the PR Ó Mesón Novo, was very helpful and friendly. The matron speaks excellent English, but the son did not. The best part is that they also run a café attached to the hotel, and since it is on a major road, it opens up at 0600 in the morning! Wonderful for a pilgrim getting an early start! 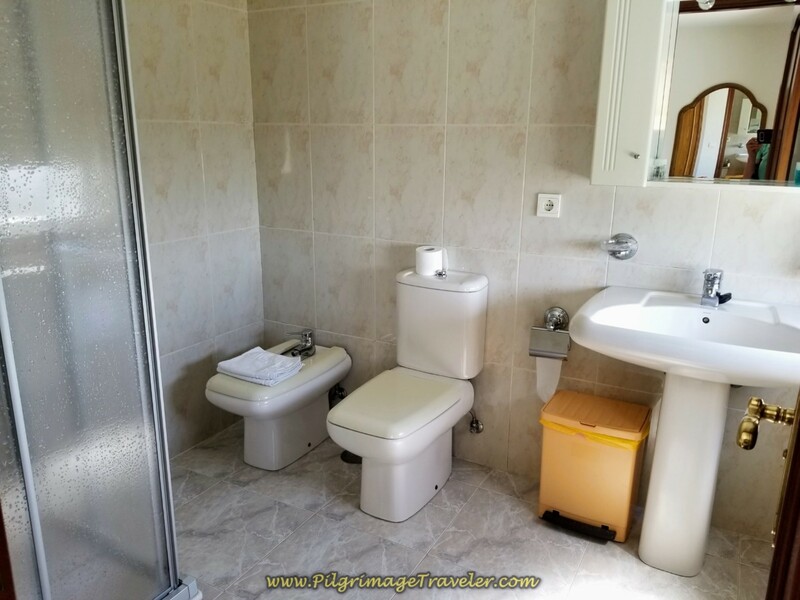 We obtained our very clean and comfortable rooms, cleaned up and had a nice long rest, meeting up at the hotel bar for a beer. When 6:00 p.m. rolled around we decided to hit the town to look for an open place for dinner. The information we had stated that the Ó Mesón Novo café served raciones at any time of the day. This was just not our experience. Sadly, none of the restaurants in Ó Mesón do Vento opened prior to 8:00 p.m. for dinner. We were disappointed in this, as we wanted to get to bed early and get an early start for our long day seven. We wanted to avoid as much of the midday sun as we could. After wasting some time at the bar at the Hotel Canaima, we went back to the Ó Mesón Novo café to see if they had tortilla or something else we could maybe eat in lieu of dinner. As we approached the café counter, and stared longingly at the tortilla, the matron of the place recognized hungry pilgrims instantly and said she could make us some plates. 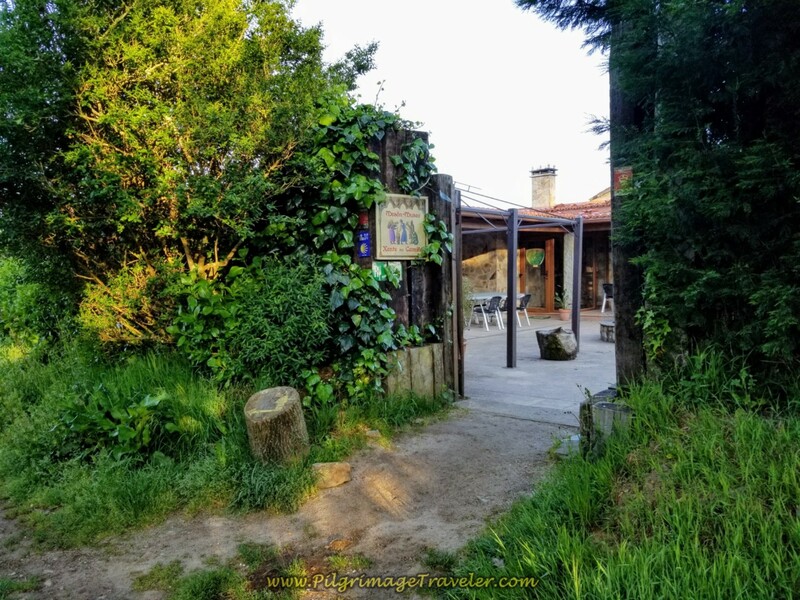 We sat down and shortly thereafter, a plate of tortilla (Spanish egg and potato casserole) arrived, followed by a plate of pimientos de Padrón (lovely little salty green peppers - a specialty of Galicia), then generous plates of delicious smoked ham and cheese, with bread, of course. We ate it all hungrily and washed it all down with delicious bottles of local red wine. I believe she charged the four of us about 33 Euro for plenty of food for us all! Incredible! We were happy satisfied pilgrims! When we discovered the café opened at six in the morning, we were even more thrilled with the Ó Mesón Novo! We would see them in the morning, for sure. Day six was a beautiful and rural walk, through endless forests paths. This could feel lonely or it could be the solitude that you need. 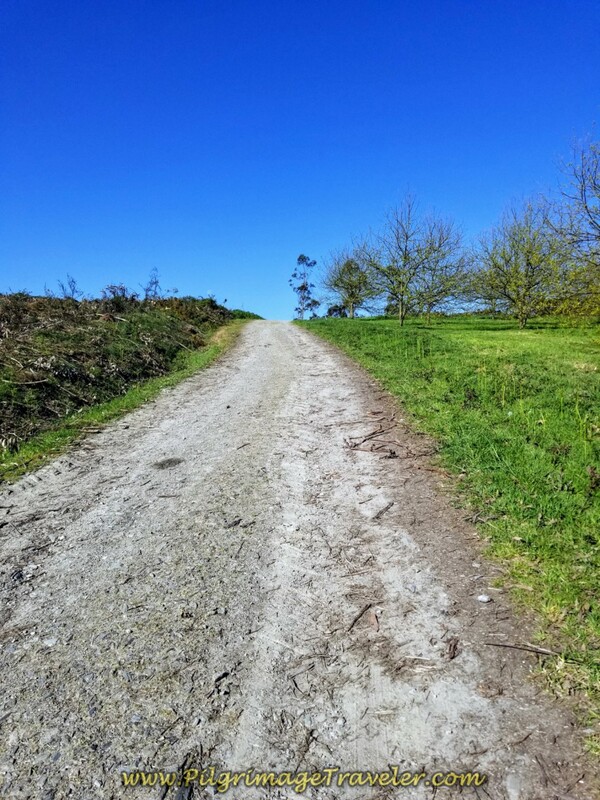 Regardless of your reception to this path, the hill climbing comprises the major part of the day. The mystery of why we climb hills I suppose can only be answered by each and every individual. 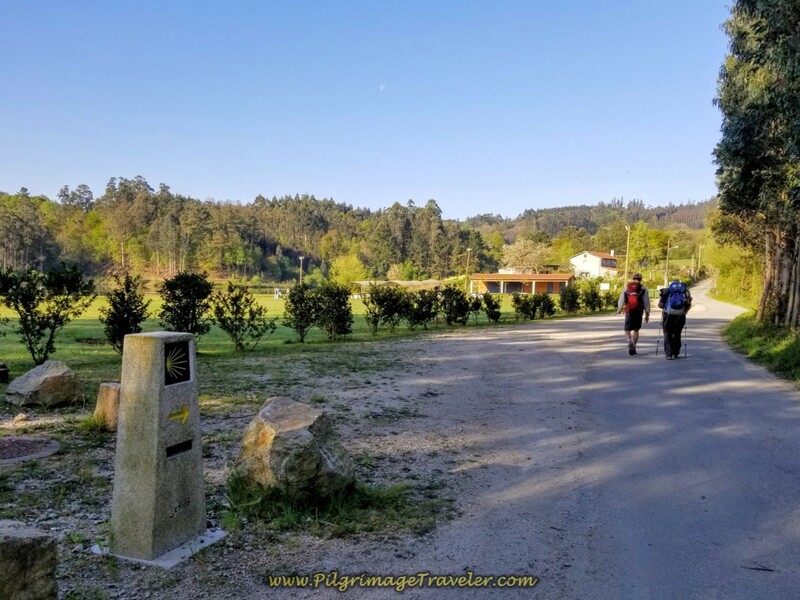 For me, as with most pilgrims I imagine, indeed it is to get to Santiago de Compostela. The hill climbs are the necessary ingredient to get where we are going. Hmm. Sounds like life. However, for me, it is more than that. It is the accomplishment, the camaraderie with both our group members and the interaction from the locals. The loving care and open acceptance that we received was quite touching on this day. Yes, these locals benefited financially from us, however, they could have taken way more advantage of us. Plus we could have been greeted with jaded hearts instead of warm and kind ones. 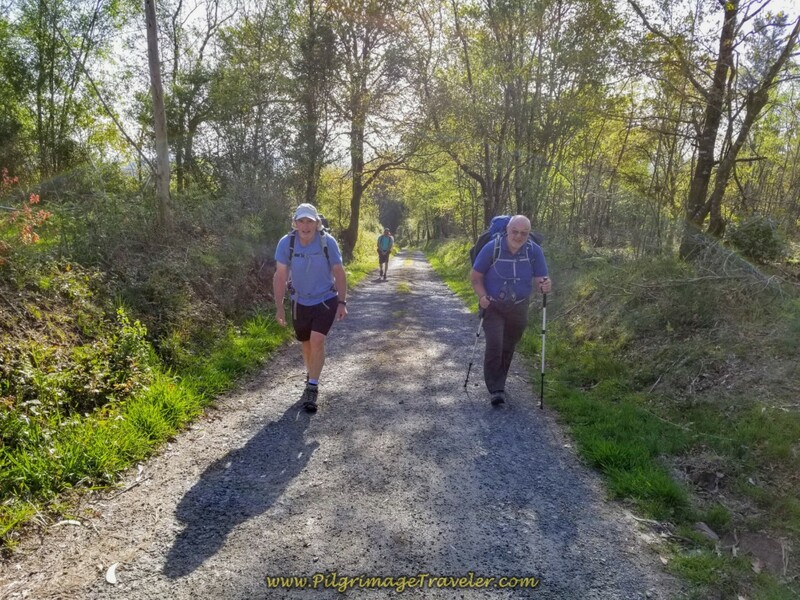 For this Camino spirit, I was most grateful. May your own day six on the Camino Inglés be filled with the warmth and care of the Spanish locals, to make your climb that much more enjoyable. May you ponder the mystery of why you climb at all! 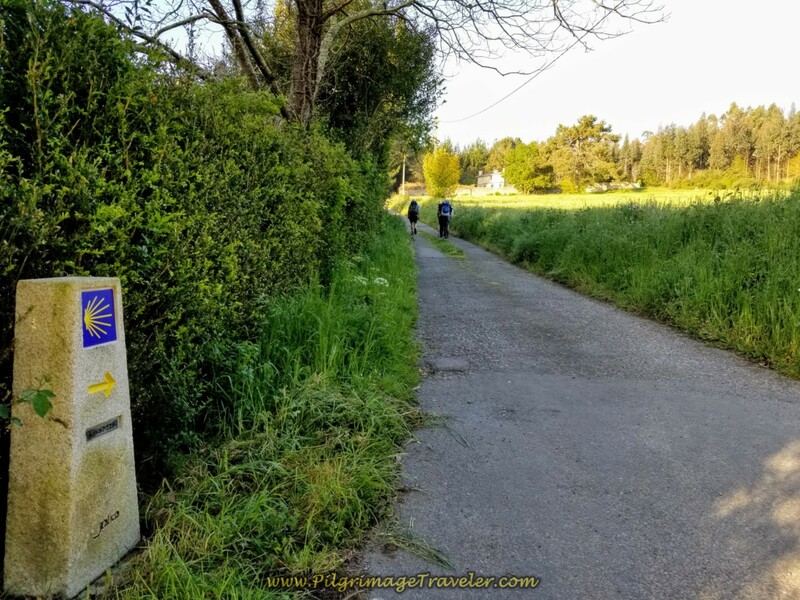 May your Camino be filled with answers to this perennial question! Ultreia!